Le Pré Lombard is at the foot of the Ariegeois Pyrenees and not far from the Spanish border. Le Pré Lombard is at the foot of the Ariegeois Pyrenees and not far from the Spanish border. The scenery surrounding the Le Pré Lombard luxury camping site is incredible. The mountains and the National Park are stunning, the Ariege River is picturesque and the traditional villages are full of character. 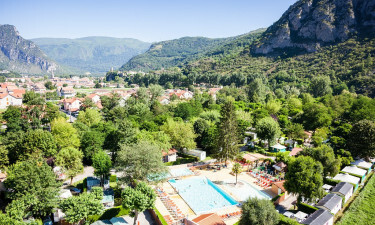 The campsite is 600m from the pretty town of Tarascon-sur-Ariege, and within a short drive there’s a long list of activities, like canoeing, hiking and canyoning. Look at the range of mobiles homes you can book with LUX-camp and choose your next holiday in France. Why should I book Le Pré Lombard campsite? A spacious pool area offers guests a lovely place to spend lazy afternoons. There is a large main pool with a sunbathing deck and lots of comfortable loungers, not to mention the toddler pool, which is perfect for the little ones to splash around and cool down. From the water swimmers can admire the backdrop of tall trees and the magnificent hillside. Book a treatment with the on site professional nature therapist. The chalet has a calming atmosphere reminiscent of a Swedish spa. There are reflexology sessions, a hot stone therapy, back and shoulder massage and total body relaxation treatments on offer. Feel vitality return and sleep deeply and peacefully after the massage. 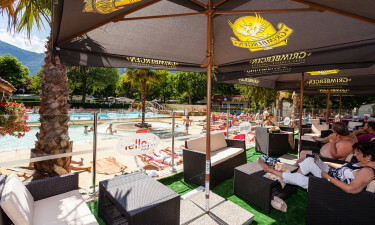 The restaurant and bar on the campsite has a great patio area overlooking the pool where drinks, meals and delicious ice-cream can be enjoyed. In high season there are themed nights arranged and everyone is welcome. A snack bar area cooks up takeaway treats like pizza, grilled meats and salads that can be taken back to your luury accommodation for lunch or dinner. A shop onsite stocks a choice of everyday supplies, like bread, milk and wine. For a wider range of goods there is an intermarche and a number of restaurants and cafes in Tarascon-sur-Ariege. Make the luxury camping experience unforgettable by exploring the local area and making memories that last a lifetime. Visit the Grottes de Lombrives just 3km away and see stalactites, cave paintings and an underground system that goes on for miles. 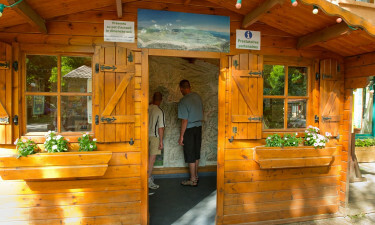 A tour takes about 90 minutes and includes an explanation and history of the caves. 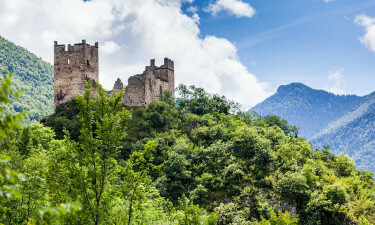 The town of Foix is 13km from the camping site and has a castle dating back to the 7th century and a museum which is worth a visit. Four days a week there are markets in the streets where goods on sale include local honey and cheeses.